ISSUE 66 - Wyatt Earp Dodge City Western Town! Christmas and the great family holidays has always been a special time here at Playset Magazine right along with homes of Americans all across this great country -- complete with all the surges in excitement, the revival of familiar cooking in the kitchens, and the anticipation of something special under the tree to tantalize. 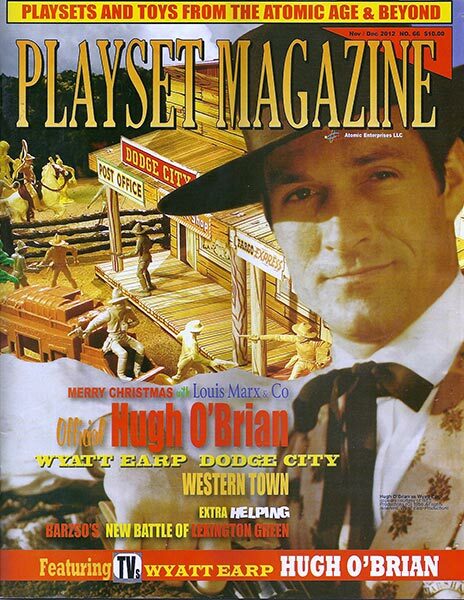 This issue we have just such a with the Marx Official Hugh O'Brian Wyatt Earp Dodge City Western Town playset. Here is special delight, as the contents match the stellar name exactly: a great interview with TV's legendary Wyatt Earp himself, replete with tales of the making of the TV show, the wonderful character figure by Marx, all followed by the most in depth coverage of these Western playset classics ever offered between the covers. You'll see the exact differences between the legendary #4228 and its companion set, the #4226, thanks to the input of experienced and knowledgeable collectors. And you'll tour the halls of the great Old Toy Soldier toy show in Chicago -- peek behind the doors to see what is on offer and meets some of the advertisers you have only known by name. Then delve into the spectacular new offerings by America and the World's greatest purveyors of new products: Nick and Deanna VerSteeg at TSSD have new U.S. Cavalry and Ron Barzso gets deservedly extensive coverage of his new Lexington Green playset, an American Revolutionary War battle spectacular complete with colonial houses and all new accessories and figures. Then there's full color vintage surprises, like the Multiples Blues and Grays store display and the regular features of readers letters, industry news, and those all-important holiday ads from the advertisers you have come to trust.